Breakfast time during winter you would have found me delighting in a hot bowl of porridge with fresh slices of banana and local honey. Now that we've said goodbye to those chilly mornings it's hello cold smoothie breakfasts for me! 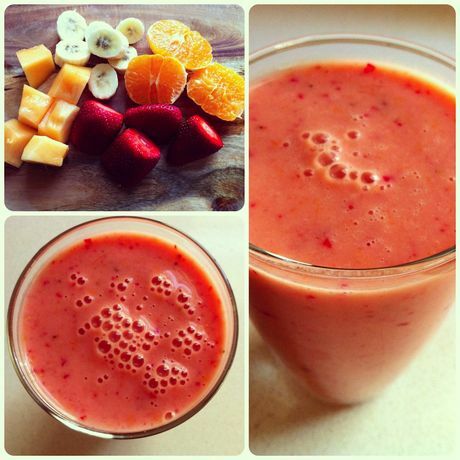 Smoothies are such a beautiful thing. They're quick and easy; perfect for those people (like me) who tend to fall behind getting ready for work. It's simply a matter of whizzing up your favourite fruits, pouring it into a drink bottle and wallah, you're sipping breakfast on the way to work - happy times! Smoothies are also extremely good for you (granted you must ignore the urge to add a dollop of ice-cream), if you stick to using raw fruits, vegetables, herbs and grains you're indeed on the right 'health-kick' track. The options are indeed endless when it comes to smoothies and personally I think they get better as the weather gets hotter - the more tropical fruits on the market shelves the happier this foodie is. I made a tasty creation the other day with sweet rockmelon, lush strawberries, wholesome banana, juicy mandarin and natural yoghurt. With a drizzle of honey and a splash of peach and apricot juice my flavour creation was complete. It looked so beautiful, even the drink itself was bubbling with excitement. Smoothies are the perfect choice to leading a healthy and happy lifestyle, so stock up your fridge with fruit today and start playing around with your own smoothie creations. Place all ingredients into a jug and blend with a hand blender. Pour into a glass with ice - Easy!